Frisee & Farro Salad Fill 1 Created with Sketch. Warm goat cheese salad is a classic dish that originated in France but now appears on menus at both casual and upscale restaurants throughout Europe and the U.S. This version maintains the French theme with the addition of tarragon and chives, two of the herbs that make up the grouping known in French cooking as “fines herbes,” traditionally used to flavor soups, salads, omelets, and sauces. Heat a medium pot of salted water to boiling on high. When the water comes to a boil, add the farro and cook 17 to 20 minutes, or until cooked through. Drain and rinse under cold water. While the farro cooks, wash and dry the fresh produce. Slice the carrots in half lengthwise. Cut the chives into ¼-inch lengths. Pick off the tarragon leaves and finely chop them. Peel and mince the shallot. 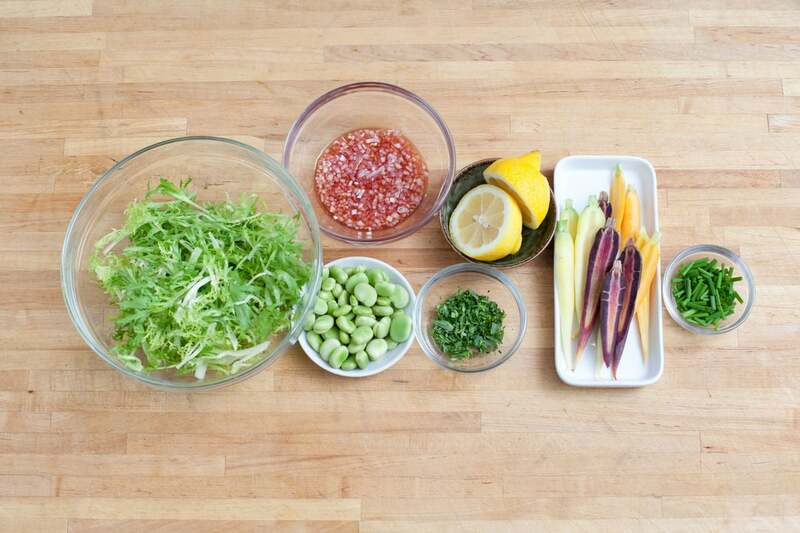 Add the shallot to a small bowl with the red wine vinegar. Tear the frisée into bite-sized pieces. 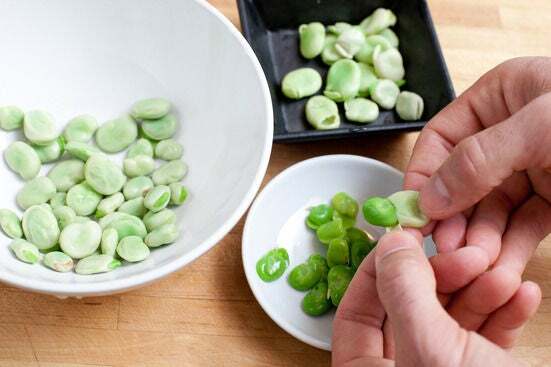 Shell the fava beans. 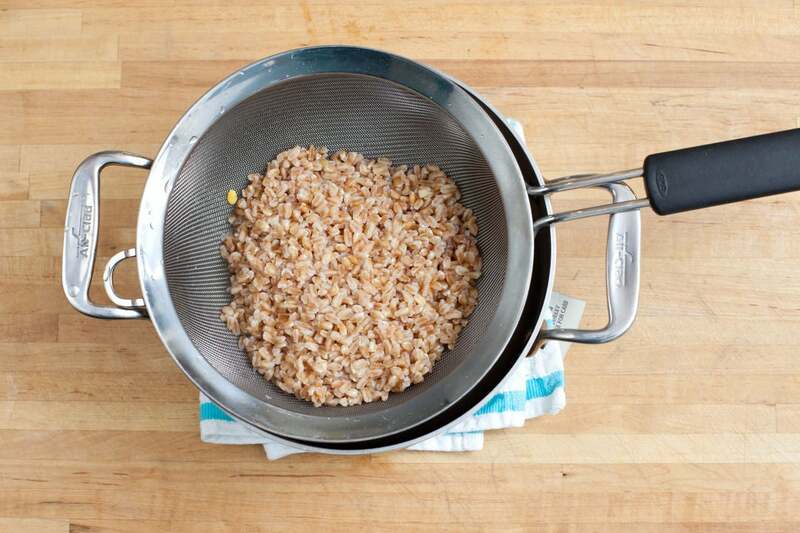 After draining and rinsing the farro, fill the same pot with water and heat it to boiling on high. When it boils, add the carrots and cook 2 to 3 minutes, or until tender-crisp. With a slotted spoon or tongs, transfer the cooked carrots to a bowl, leaving the water in the pot. Add the fava beans to the still-boiling water and cook 1 minute. Drain and rinse under cold water. When cool enough to handle, use your fingers to pinch off the tip of each bean and squeeze them out of their skins. While the water comes to a boil in step 3, add the flour, milk, and panko to 3 separate, shallow bowls. 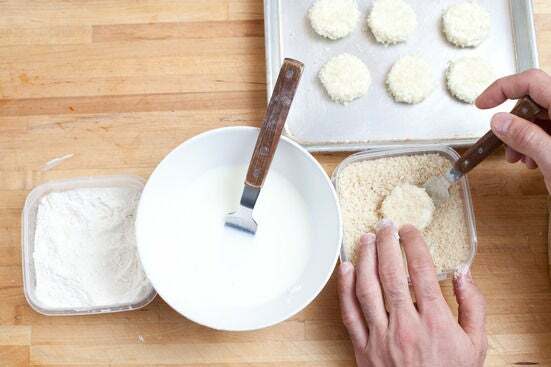 Dip each goat cheese disc in the flour, then the milk, and then the panko. Heat a layer of oil in a medium pan on medium until hot. Add the breaded goat cheese discs to the hot pan and cook 1 to 2 minutes per side, or until crisp and golden brown. 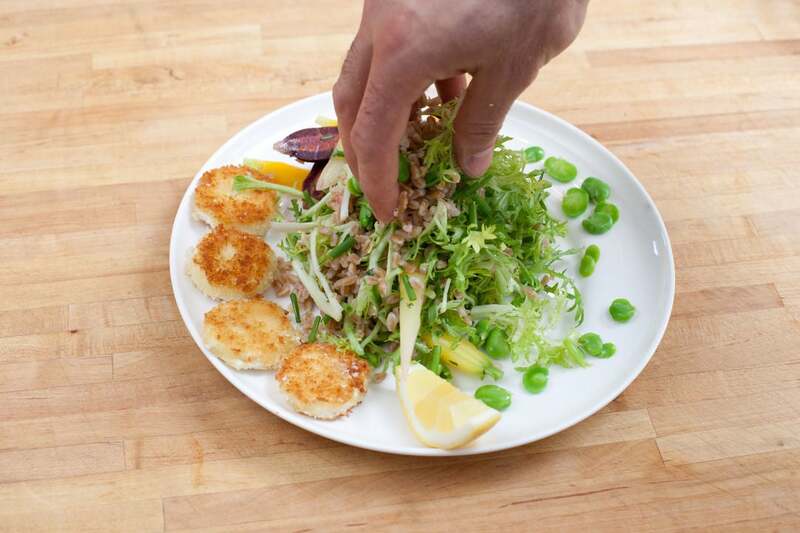 Transfer the crispy goat cheese to a paper-towel-lined plate. Squeeze a little lemon juice over the cheese and season with salt. Gradually whisk enough olive oil into the vinegar-shallot mixture to make a dressing. Season with salt and pepper to taste. In a large bowl, combine the frisée, carrots, farro, half the chives, and half the tarragon (reserve the rest for garnish). 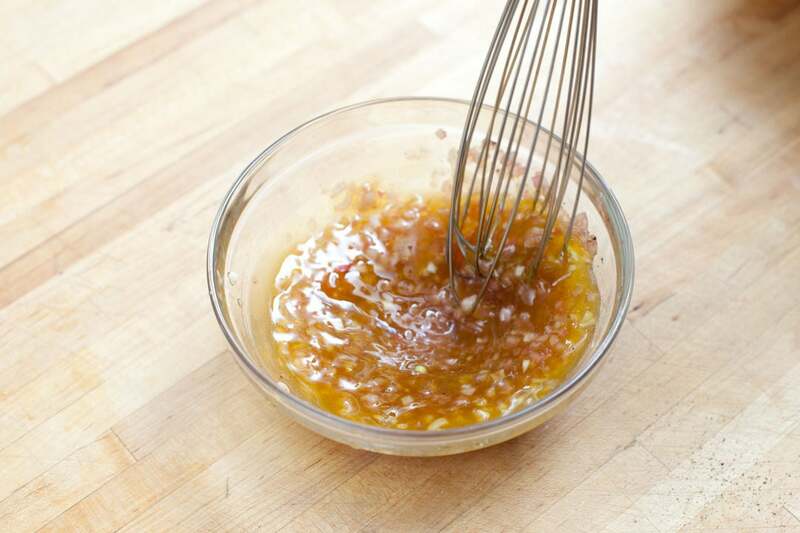 Drizzle some of the dressing over everything and toss to coat. (You may have extra dressing.) Season with salt and pepper to taste. Place half the carrots and half the goat cheese slices on the sides of 2 plates. 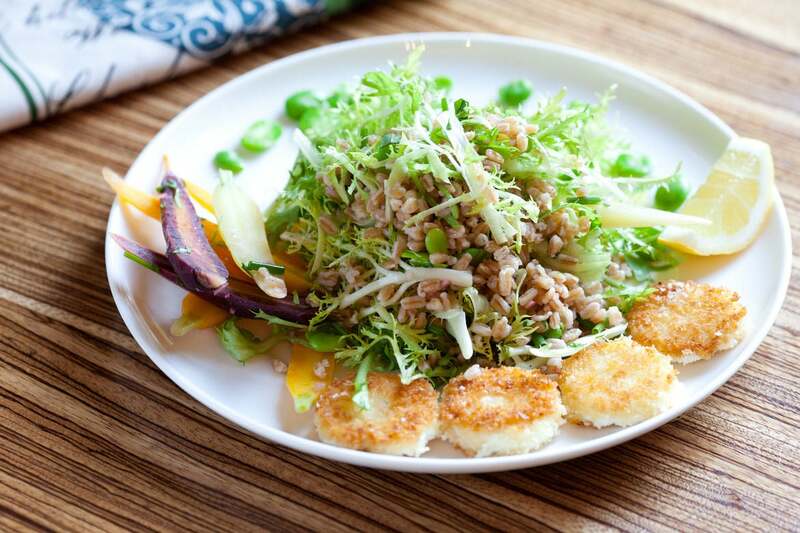 Place the frisée and farro salad in the center. 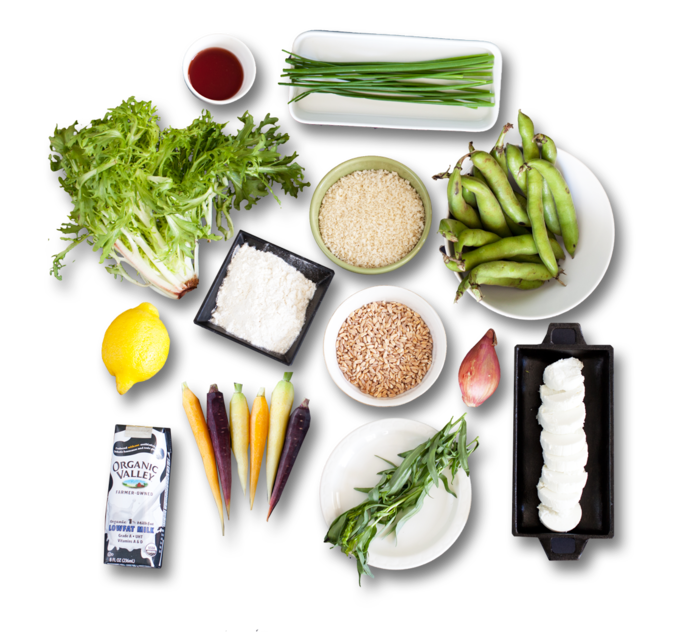 Sprinkle the fava beans on top. Garnish with the remaining chives and tarragon. Serve with lemon wedges. Enjoy!